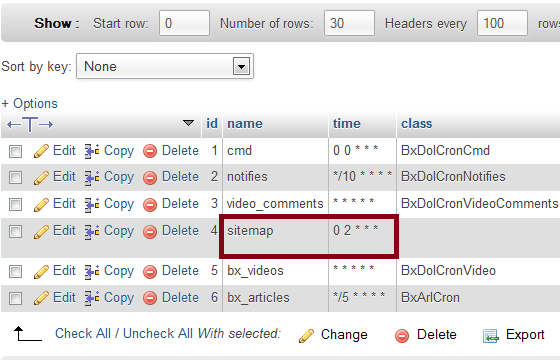 One of the new features included in Dolphin 7.1 is an automatic sitemap generator. If you want to test or use the new sitemap feature you can enable it in the Administration Dashboard. 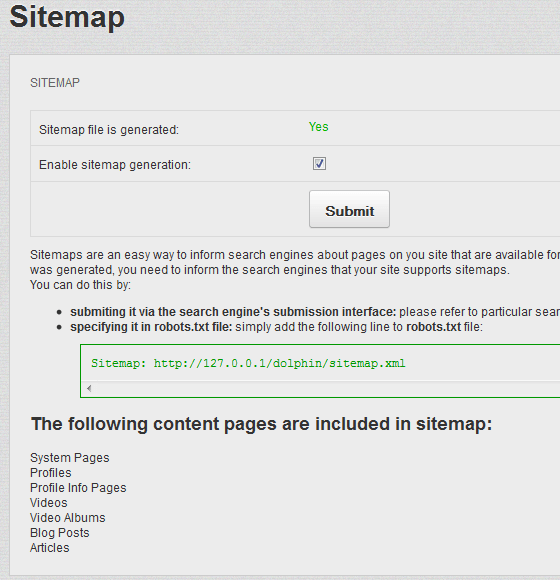 Check the box "Enable sitemap generation:"
And, click the "Submit" button. You can submit the actual link to your sitemap to Google and other search engines, which will help them find and index your pages and posts. For Google all you need is a free Webmaster Tools account. On the top right side of the page find and click on the "ADD/TEST SITEMAP" button. Enter the link to your Dolphin sitemap and either click "Submit Sitemap" or try the "Test Sitemap" button first. Once submitted it will show up below this. Google will eventually tell you how many links are in your sitemap and how many of them have been indexed. If there are any errors or problems it will also provide additional details about these as well. You don't have any control over what is or is not added to the sitemap. It is either all (enabled) or none (disabled). If you have a private membership site that requires logging in to view some or all of your content that means Google can't access it either. What will end up happening is if your sitemap contains for example 1000+ url/links Google will try to access them, but it will find exactly the same title: "Access Denied" and the content of each page: "You don't have permissions to access this page" for all 1000+ links. This could cause problems and lead to duplicate content issues. I just don't see the point of creating and submitting a sitemap to a search engine like Google if it can't access the content of the posts anyway. Another thing is you will find something similar to this if you visit your sitemap.xml page. I am not really that excited to see profile_info.php?ID=1 types of links in a sitemap. Cron 0 2 * * * is 2:00 AM Server time. So it should get updated every morning at 2 AM. Test it out and see if it will work for your needs.